We are lucky to have another guest blogger today! 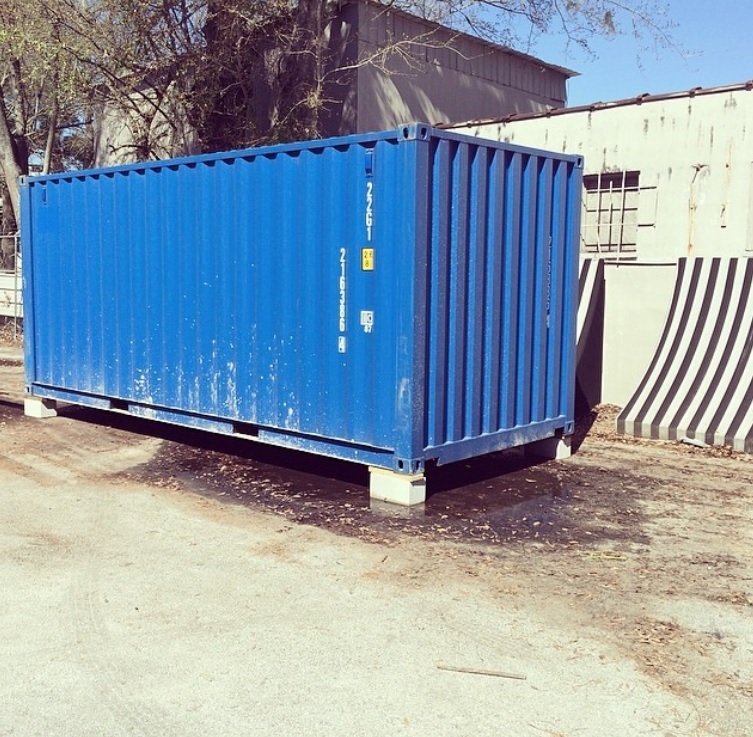 Today’s post comes from a Super Cubes client in Florida, Sterling Cox, founder of Southworth LLC, who is converting a one-trip 20’ container into a prototype living space, to be used as a production model. You can follow the pictures they are posting to Instagram at http://instagram.com/swlivingspaces#. Or, if you’re in the Jacksonville area, they’ll be debuting the finished product at a festival called OneSpark from April 9th-13th (www.BeOneSpark.com). Like so many other container projects, they are balancing their goal of using green building practices with being cost-conscious and also energy efficient. They recently added a vapor barrier to the container before insulating it. We adhered a layer of Tyvek Home Wrap to the inside of the container for the vapor barrier using 3M all-purpose spray adhesive. This process was difficult with two people, and I imagine nearly impossible with one. According to everything I read from what I determined to be credible sources, and my neighbor Randy who has been a contractor most of his life, a vapor barrier is essential. 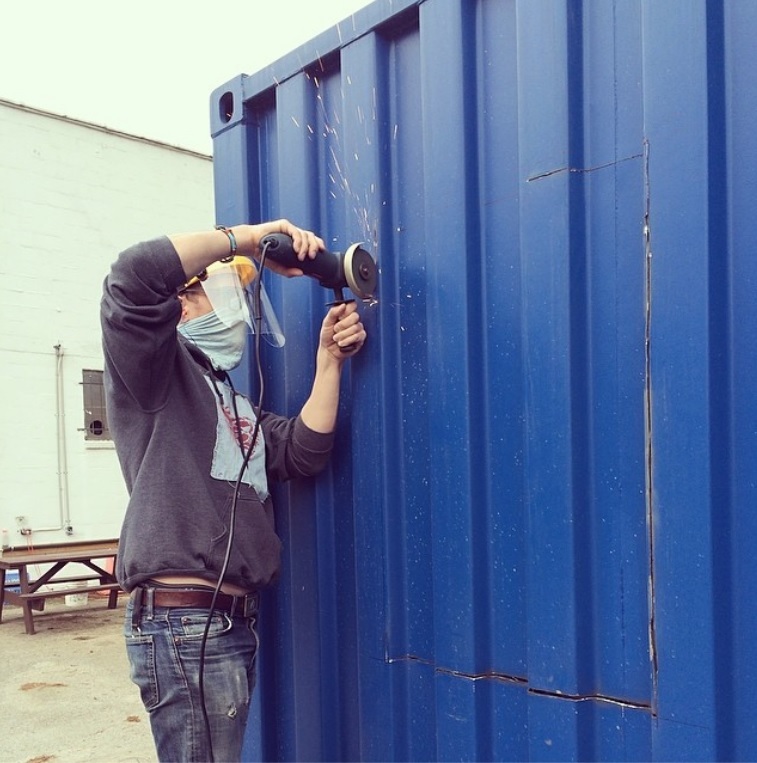 Containers are apparently notorious for condensation build-up on the inside or “sweating,” especially in humid climates. A vapor barrier blocks moisture from entering a home. It can be a foam or some other type of insulation, or more typically, a film or sheet. Conventionally the house wrap, Tyvek or another brand, is applied to the outside of a “normal” home being built, stretched taught and stapled in place before the siding goes on. It is the easiest to obtain through a retailer, and by far the cheapest option. The spray adhesive is necessary to have the film adhere to the wall as it gets rolled on. To extoll the green benefits of our decision to go this route, I’d say the wrap itself is recycleable, a #2. This is a polyethylene, same as a milk jug, shampoo bottle or Smart Balance tub. The apparent R-value is non-existent, being that it is the thickness of construction paper. The simple fact is that it was a necessary step in construction. Tyvek is manufactured by DuPont, a large chemical corporation, one that is undoubtedly manufacturing many products that, though useful, have difficulty diffusing into the ecosystem as it were. So be it. Sometimes awareness is all that you can offer. The spray adhesive is manufactured by 3M, and simply by its odor and effectiveness, it is apparent that it is far from a green product. They advertise low VOC, though. Note: if you use this or any other spray adhesive in a container, cover your hair and wear long sleeves and pants. Wash your hands with mineral spirits afterwards. I’d use Typar or HomeGuard house wrap. Both companies claim to have recycled content in their product, are part of the Green Building Council, and at least mention LEEDS in their respective websites. Another credit is that both companies actually address some sort of environmental awareness, whether or not it’s a marketing ploy. Note: both brands are more expensive than Tyvek. As far as adhesives go, I’d order one that was from a smaller corporation, and had some sort of green credential. In my research, I find that at least attempting to sound green deserves a little credit. As I mentioned, being under a time constraint, we opted to use what we can get at the store as opposed to waiting for an order to be delivered. I’d do some more research and find a spray-on vapor barrier. Naturally I’d look for something green, but even a petroleum-based product would be justifiable. The FoamIt Company manufactures a DIY spray foam that is apparently soy-based, but after reading the fine print it seems a bit dubious. No matter, any soy insulation is actually petroleum-based with soy content added. This kit offers 600 sq. ft. of 1” foam, which is very close to the amount needed to cover the two long walls, back wall, and ceiling of a 20’ container. It’s closed cell, so it’s an effective vapor barrier. The 1” of foam has a rating of R-7, which is a good start in conjunction with another type of insulation. The kit is $630, so cost is a factor. After you begin spraying, it’s apparently unusable after a month. When all is said and done, I’ve spent under $150 to have a vapor barrier that is trusted by industry professionals and experts. I detested every minute of the application, the aesthetics of it severely irritate me and I honestly cannot wait until it is covered by insulation. Certain types of readily available primers such as Zinsser’s BIN or Sherman William’s Moisture Vapor Barrier have acceptable perm ratings per most building codes, between 0.1 and 1 perm. Really really going back, I’d use something along those lines. Another option I only briefly explored, but might end up being a very effective option would be to use some sort of spray on bedliner used to coat the beds of pickup trucks such as Rhino Liner. You can email Southworth LLC at swlivingspaces@gmail.com. Have you installed a vapor barrier on a container? What worked and didn’t work for you? What advice would you have for someone planning on applying one? Below are some pictures from the project.